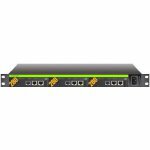 VB20 is a powerful portable platform for measurement and monitoring of broadcast networks (specifically built for monitoring of IP networks with L3 routing and IP/MPLS). 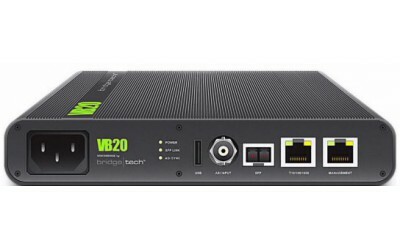 VB20 is provided with wide range of interfaces: ASI IN, electrical and optical GigE ports, control port FastEthernet. At simultaneous analysis of up to 260 streams, full display of T101290 errors, enhanced case, and absence of fans, VB20 is ideal as portable tool for network troubleshooting. To monitor the video streams, VB20 is provided with support of MPEG-2 TS, MFRTP, and all the latest codecs. Function of detecting the multicasts in different VLAN will be useful for analysis of traffic at network mains. Monitoring of such critical parameters as MDI (RFC4445) and jitter enables the forming of clear idea on network performance. Use of patented technology MediaWindow enables the access to log data and visual representation of processes occurring in the network. EII technology, support of multiple SNMP traps servers, and export of data to XML format allow the integration of IP-probe with third-party systems. Initial VB20 setup is realized via built-in USB – RS232 converter. Control can be implemented via built-in Web server, TELNET protocol or transfer of control messages in XML format. 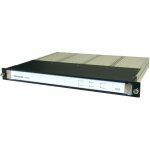 FoxGate S6224-S2 is a managed switch with 24 ports of 10/100 Mbps Ethernet and two Gigabit Ethernet ports for connection to the backbone, combined with slots for SFP-optical transceivers. 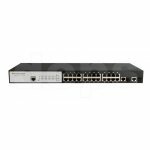 Switch FoxGate S6224-S2 has a unique networking opportunities, including the following: MAC address filtering, support IEEE802.1Q VLAN, QoS, ACL, IEEE802.1x, IEEE802.1d / w, Port Mirroring, SSH, which makes this switch the best means for constructing Ethernet-networks in business complexes, corporate and municipal Ethernet-networks. VB280 is a content extractor (to extract the service data and decode the video in MPEG-2/MPEG-4 format, with detection of scrambling and frozen frames). 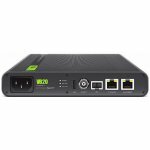 VB280 enables extraction of meta-data, simultaneous viewing of up to 100 TV channels in thumbnail mode, and visual monitoring (both on control equipment and in web-browser window).